A final draft is a piece of writing that will be handed in as your best work. Students should treat crafting a final draft as a task of increased importance, because it is their last chance to enhance their paper and correct any flaws. Take a break after writing your second draft. You will have to revise your second draft at least three more times until it is put in order—have a rest before starting the final copy of your paper. Do a spellcheck of your second draft. You should revise your paper in terms of misspelled words, typos, and accidental word repetitions; you could also perform a punctuation check at this interval. Do a grammar check. It is a process that requires extreme caution, because grammatical mistakes may be far less obvious than spelling errors. This check implies correcting faulty parallelisms, problems with noun-verb agreement, dangling participles, improper usage of passive voice, and so on. After you’ve checked the language of your paper, it is time to pay attention to its technical aspects. This includes the formatting style, your reference list, in-text citations, and the title page. Make sure all of these correspond with the requirements of your teacher or the publication you are submitting your essay to. Revise the whole piece of writing once again. Since it is the last time you will read through it with an intention to make corrections, be extra-attentive and check every little detail in the text. Evaluate the structure of your essay, the way your arguments are organized, and the credibility of these arguments. Check for poor or non-existent transitions between paragraphs, pay attention to grammar, stylistics, syntax, and punctuation. Reading your final draft aloud will grant you an opportunity to take a fresh look at what you have written. Weaknesses in writing are usually easier to notice when heard. Your paper should be written in your own words, except abstracts where you are using citations. It is always better to show your own understanding of an issue, even if it is incorrect, than to frame your ideas in another author’s words. 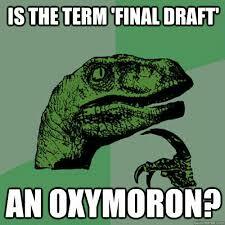 A final draft is your last chance to exclude any possible signs of plagiarism from your paper. Using a computer for proofreading is a sound idea, since text processing software often has a function of automatic spelling and grammar checking. However, proofreading on your own once again after the computer check is still recommended to avoid mistakes a computer may not have found. Do check whether your thesis statement is stated clearly, and whether it encompasses all of your key ideas. Also, check if your introduction draws readers’ attention in. Do check whether each of your paragraphs represents an idea. It is important that multiple ideas are not crammed into one paragraph; topic sentences showing these main ideas should be included into each paragraph as well. Do evaluate your evidence. It shouldn’t be insufficient, but the paper shouldn’t be overburdened with too much factual information as well. Don’t try to read your writing on a computer screen. After you’ve made a spell-check on the computer, print your essay out, and proofread the hard copy. It is much easier to perceive information on paper. Don’t rely on automatic spell and grammar checkers. Though these tools contribute to the process of proofreading, they are far from being perfect, therefore they can miss obvious errors. Don’t leave proofreading the final draft copy for the last minute; give yourself enough time to revise your paper thoroughly, because most likely this piece of writing is the one you will hand in. Don’t be afraid to give your final draft to a friend or another person you trust for proofreading. A person who has never seen your piece of writing will take a fresh look at it, and most likely notice flaws and errors you’ve missed. – Incomplete references. Students often tend to hurry when crafting the final draft to finally finish the writing process, and forget about the proper formatting of in-text citations and sources in the reference list. – Forgetting to spell out abbreviations. You should provide a complete transcript of a certain term or name before using an abbreviation for it. – Not explaining the meaning of uncommon words. Students use a term with a specific meaning, but forget to specify it; spell-checkers may not flag the term, and neither will these students pay attention to it while proofreading since it may have been spelled correctly.